Farrington, of Wellington, Fla., will ride Robin Parsky and his own Gazelle, a nine-year-old Belgian Warmblood mare. This pair has competed successfully since 2014, with top placings in major classes at the Winter Equestrian Festival, CSI5* Rome, and CSI5* Spruce Meadows. 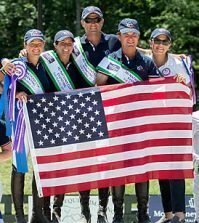 Farrington has been a significant contributor to U.S. team success, including as a member of the Bronze medal-winning team at the 2014 Alltech FEI World Equestrian Games and the Gold medal-winning team at the 2011 Pan American Games. Hough will compete on the Ohlala Group’s Ohlala, a 2004 Swedish Warmblood mare, with which she has had much success both at home and abroad. The pair has garnered top placings in Nations Cup competition, including as members of the winning U.S. team in the 2014 Furusiyya FEI Nations Cup Jumping Final Challenge Cup and Silver medal-winning U.S. team at CSIO4* Ocala in February. Hough represented the United States at the 2000 Olympic Games, the 2003 and 2007 Pan American Games, and at the 2010 Alltech FEI World Equestrian Games. Bloomberg, of New York, N.Y., and Gotham Enterprizes LLC’s 2004 Deutsches Sportpfred mare, Lilli, will also represent the United States in the Games. Bloomberg is a seasoned competitor, both nationally and internationally, with successful outings in top level competition. In 2015, Bloomberg and Lilli have had top-ten finishes this year at CSI5* Wellington and CSI5* Spruce Meadows. Ward brings a wealth of experience to the U.S. Pan American Jumping Team. Ward has represented his country in three Olympic Games, including as a member of the Gold medal-winning teams in Athens in 2004 and in Beijing in 2008 aboard the legendary Sapphire. Ward has also been a part of three FEI World Equestrian Games U.S. teams: 2006, 2010, and 2014. No stranger to Pan American competition, Ward helped to secure a Team Gold medal win in the 2011 Games. At the 2015 Pan American Games, Ward will pilot Sagamore Farm’s 14-year-old gelding Rothchild. The pair has forged their successful partnership since 2009, garnering top prizes at elite shows at home and abroad. 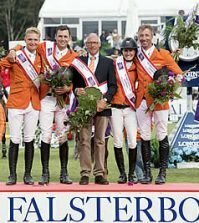 Ward and Rothchild combined to win a Team Bronze medal and a fifth place finish individually at the 2014 Alltech FEI World Equestrian Games. In 2015, Ward and Rothchild achieved top placings in CSI5* Grand Prix classes in Wellington, Fla. and at Spruce Meadows in Alberta, Canada. The athletes and their horses will be supported by veterinarian Dr. Tim Ober, physiotherapist Janus Marquis, and farrier Ken Bark.